For our 8th video of the month, we have Weihan. We all know what a great cheerleader this guy is already, and he continues to wow us all again with this tick tock pop over. You made it look damn easy too. Any tips for the bases in SG? The 5th video entry for May VoM is again by Kerry and tagged by Ochi. Another of Team Singapore tryouts video, this time of Jasmine. Amazing tryout by Jasmine, ROBHBT, B Toss layout fulls, full ups pyramids as top and mid, rewind, full ups, full around, double down for partner stunts. Simply awesome, definitely the most all rounded female cheerleader I have seen in SG so far, and not only that, you possessed a wonderful personality to go with all that skills, very nice and friendly, humble and encouraging. This tryout video will also be one of your fondest memory you can take away from cheerleading. You will make SG cheer proud on the mats. Jiayou. The 4th entry for May VoM is by Kerry and tagged by Ochi. This is the tryout video of Harlis for Team Singapore. Harlis though you did not make the team at the end, we are all very proud of you for your efforts and dedication to SG cheerleading. You took the first step out and I am sure you will inspire many more cheerleaders in future to come forward, when SG cheer needs you all the most. And you definitely had 1 of the best partner Stunt try out sequence during the tryouts and hitting it on both tries. A video by Wee Keat for our 3rd entry for May VoM. It is a video about NTU Hall 13 Team Spectrum Cheerleading. It shows the trainings, failures and then the success of Spectrum in NTU HO 2011. I love the dancing at the end of the video, you guys have very good dancers. 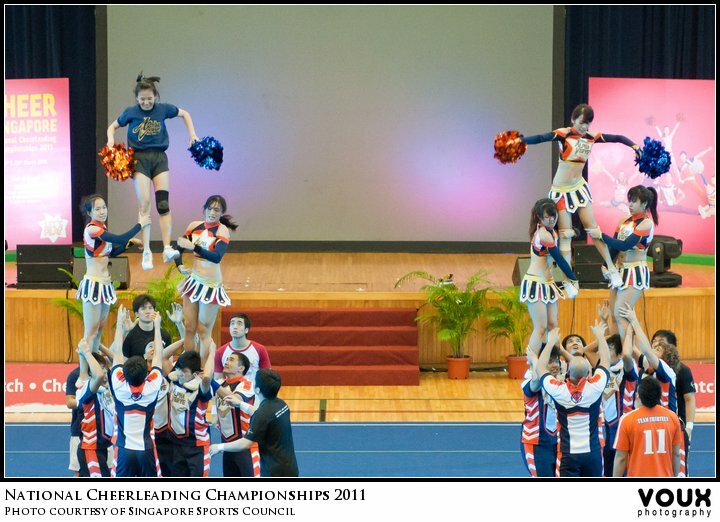 Spectrum has definitely come a long way since my time when I was still competing in HO. Jiayou guys and continue to cheer. The 2nd video entry for May VoM is by Neville and tagged by Jiahui. If you guys are wondering why is it YIA, it is a name coined by Neville based on the position the flyer goes through. Good job Astros, you all made it look simple, will hope to see it in our performance soon. The 1st entry for May VoM is by Candy from Wildcards. It is a video on her FHS up with Weihoe. It has such great height in it, the best FHS up I have seen done by our very own SG cheerleaders. Both of you have improved so much over the past few years. Weihoe has definitely grew much bigger and stronger since we first met, all the hardwork in the gym paid off; and I can say that Candy has also grown alot as a flyer and starting to inspire many new flyers out there. Thanks for the tips and help in the FHS up too. Hope to see the 2 of you stay in cheer for long time to come and continue doing amazing stuff. P.S: Watching this video again just makes me feel the pain again once more. You know I should have posted this entry like few weeks ago, but it's either I had been real busy or had been procrastinating. I would just want to write down some of my thoughts and feelings I had for SNCC with Alpha and also for the past 1 year. I had been coaching for more than 5 years now, but this is my first year as a coach for a team participating in Nationals, as the coach of Alpha Verve. 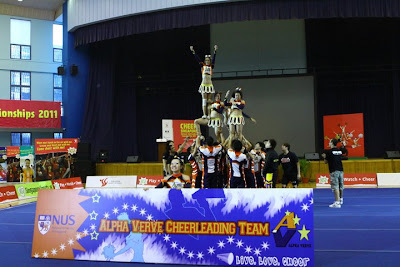 I took up coaching Alpha Verve last year in May 2010. I have to admit that in the beginning, I was nervous, as I would be meeting new people, and being in a new environment and different culture; as compared to when I was coaching my Hall for HO and when I was in my previous team ACES. 2010 was also the year that had been very significant for me, the year that I decided to do something about my life, to change myself for the better and to get out of my comfort zone. For that reason, I decided to go ahead and take up coaching Alpha Verve, to step out of my comfort zone and to bring value to more people. I am very glad that I did that. When I took up coaching Alpha, the players were mostly fresh, or with 1 year of experience. It was the year that many of the seniors that had been with Alpha for the past 3 to 4 years graduated. I knew that alot of work had to be done. 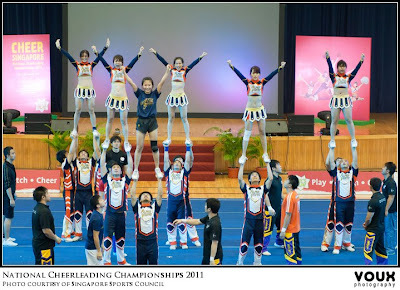 We did lots of basics in the beginning, correcting the fundamentals, so that the seniors, when the freshmen comes in, can teach and demostrate the proper techniques of cheerleading and educate the freshmen as efficiently as posible. It is worth it, the basis training is what allowed them to pick up more advance skills as they move on, and also for the juniors and freshies to catch up quickly. Something that I really loved about Alpha Verve is their organization. They had a very well formed committee led by their captain Terence that managed the team very well. I never had to worry about anything other then to focus purely on coaching them and playing an advisory role. The team was very disciplined; other than captain Terence, they had many good leaders such as Joseph and Liyuan who takes charge of the warmups and helping me to keep the team organised and motivated during trainings. Every other members as well also played their role from logistics (Congren), uniforms (Elaine), banner designing (Eng Meng), liasing for performances (Weiting) and of course everyone else for working so hard on the mats. Another group of very important people also are the seniors, or Avatars as they call it, who came back to help out and guide the team, esp Biyi, Nigel, Jane and Jiayi. The seniors are the beacon of light for the juniors, to guide them whenever they are lost or in doubt. With all these help from the managing committee and Avatars, we were able to conduct training efficiently most of the times. And soon after the sports awards performance, everyone is able to reach a same level and stardard; the freshies and juniors were able to catch up sufficiently to start training together with the seniors for Nationals. Of course during this period we also had to face some dropouts as well due to various reasons, mostly studies and time commitment issues. But nevertheless, everyone was still there supporting each other, as a family and working towards our common goal set at the start; though sometimes it takes some reminders to remind them what their goal was and to realign everyone. And now to fast forward a bit nearer to Nationals. Every team has their own difficulties and problems they need to overcome, for us it was injuries and confidence issues. Just less than a month away from Nationals, we had to source very hard to find replacement for our flyers down. I would like to thank Terence and Joseph especially for looking around so hard and trying their very best to get replacements. Also a big thanks to Jiayi for coming back to help out in the team in such short notice. The seniors really had a big part to play for this nationals. I would also like to thank Jane Lee, even though you are not formerly from Alpha, but you came down and helped despite not knowing everyone except Alice. I would also like to thank Wildcards, especially Chaang, Gary, Ochi and Hann Bin for providing me with suggestions and accompanying through this difficult period; and also for all your help during the trainings. Thank you Jon for the wonderful music and redbull jellies too. When everything seemed good to go, everyone was in good spirits, then just 3 days before SNCC 2011, Alice fractured her finger. Again we had to source high and low for solutions and contingencies. This time round it was even more desperate than before and I almost could not sleep because of that. After a day of scare and worrying, fortunately for Alpha, we got ourselves a very strong flyer in Alice and she decided to continue with heavily bandaged fingers and enduring through the pain. Now when the day of SNCC arrived, it was as if the drama never ends, Alice fell from split mount during our final all out rehearsal and injured her shoulder. She was sent to the hospital with only 2 hours left to competition. Again we had to find a contingency and with only 2 hours to go, we had no other option, but to ask Xuewei to stand in for Alice, for only she knows Alpha routine inside out. Alice fell was really looking pretty bad and serious, I never thought she would be able to make it. But with only about an hour to go, Alice proved to us all again what a strong flyer she was. She came back with tears in her eyes when I saw her, but still made the decision to go out there and compete despite the pain and truama she had been through just hours ago. Let's not forget that Alice is already fighting the pain from her fractured fingers and now this. For this, I had to commend Alice and if there was a best cheerleader award for SNCC, it definitely has to go to her for her perserverance and courage. Alice you definitely showed everyone out there what a cheerleader is about, and for giving everything for what you want to do most. Finally Alpha took to the mats and performed their best ever routine, despite a fall right at the end. The rush of emotions immediately afterwards was almost indescripable. It felt like relieve, happiness and some minor dissapointment (for the last fall) all rolled into 1, but majority of it being happy and really glad that everyone did their best out there. After the performance, many came over to us and congratulate us and said that this was the best ever routine Alpha Verve put up in Nationals. This acknowledgement really means alot to me and the team. Something most important that I learnt from this experience of coaching Alpha for 1 year is that, never expect everything to be smooth sailing. And as a coach, a leader of the team, you must never be defeated no matter the situation, you are their source of support and direction. I learnt to be strong in the face of adversity, this lesson I will never forget. Though let's hope that after all these, Alpha can have a ever better year ahead. I shall leave you guys with some photos taken during Alpha's best ever performance. P.S: Alpha, we are better than ever! We are finally going to have our very own Singapore National Team under FCS. It took great efforts on FCS part, sorting out and overcoming all the diffculties such as funding, venue and coaches. And I am really very excited about it. Singapore cheerleading has definitely grown over the past few years, standards rising every year and we are seeing more and more cheerleaders joining the sport as well. 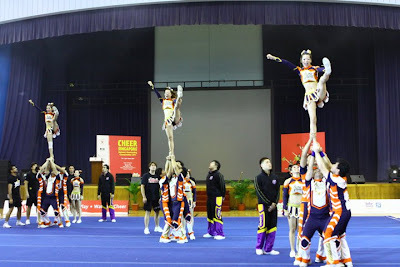 However that is just locally, and I believe that if we can gather all the best cheerleaders in Singapore to form the national team, we can do very well on the international level as well. Singapore definitely has what it takes to give the regional power houses like Japan, Taiwan, Thailand etc a good run for their money if we have the support and contribution of every cheerleader and their teams. Imagine a routine that is on par with the routines that the power houses had been showing to us over the past years. Those routines are definitely within our means if we can pull our strengths and resources together. Representing your country is an honour and a huge privilege, to show the world the best Singapore can offer and also to compete with the best in the world. Definitely the road might not be easy, sacrifices had to be made, which all cheerleaders should have been well aware of by now. Singapore National team is a new initiative and we might not fully know all the difficulties it may face, what difficulties a player may face, such as time management of individuals from all walks of lives and also other logistical issues and funding issues. However all these can be overcome together, as you overcome the problems your team faces in the past, as long as we all take the first step out of our comfort zone, be willing to sacrifice for Singapore cheerleading, no problem is too big to handle. 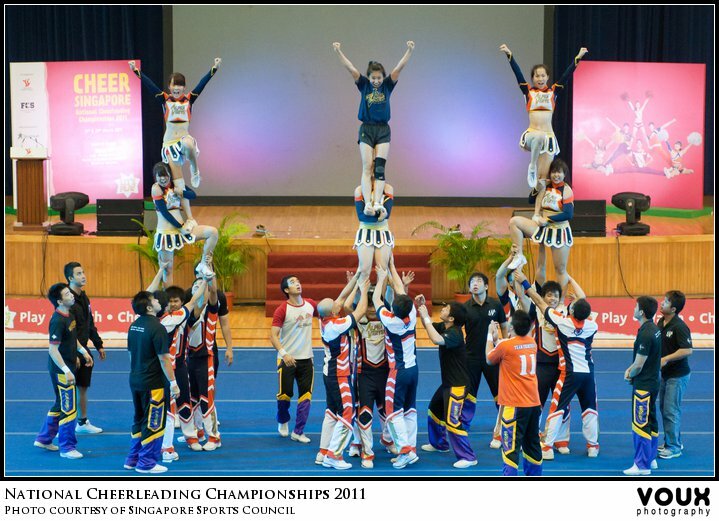 I sincerely hope that every cheerleader and teams out there to support Team Singapore Cheerleading all the way. Firstly for those who meet the tryout criteria for the national team, I urge you all to attend the tryouts conducted by FCS this weekend. There is no need to think too much of whatever problems or difficulties you may face in future first if you do not even take the first step out, which is to go for the tryouts. Do not worry about your skills too, often people are better than how they would see themselves to be, let the coaches decide. Go for the tryout first, take 1 step at a time. A journey always starts with the first step. When presented with something new, winners always think of the opportunities and losers think only of the difficulties. The day I am waiting for is finally coming soon, let's all show the world what Singapore cheerleading can be. As Nationals 2011 was just over few weeks back, all the post were about nationals. For this month, it is also the 1 year anniversary since VoM was introduced, to commemorate the the occassion, special prizes totalling $200 was given out. As BPoM is a partner initiative with VoM, Chaang is awarding prizes dollar for dollar of VoM. So this month, the winner of BPoM April'11 will stand to walk away with $200. So with such a great prize, everyone should be excited about who the winner will go to right? And the winner of BPoM April'11 goes to.... The post by Nellie (tagged by Huishan)"THANK YOU EVERYONE ♥". Congratulations Nellie for the wonderful post and Huishan for tagging, you have won yourselves the total prize of $200. Wonderful post by Nellie on Nationals and also her 6 years of cheerleading career. Lots of effort put into it too. It is a reminder for all cheerleaders to be grateful for what they have gotten out of cheerleading so far. "Nellie has definitely put in a lot of effort in this particular entry. all cheerleaders that when the going gets tough, the tough gets going. made who we are possible! P.S: Thanks for everyone's support and pls continue to support BPoM and VoM. From time to time, prizes will go up again in future, so be sure not to miss it. The winner for BPoM March is by Stanley from Team Seven. 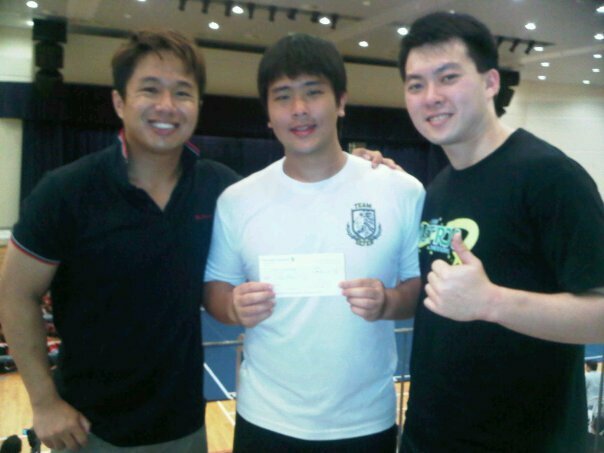 He won himself $60; extra 20% for blogging about NTU HO 2011. Another video entry for April VoM is a video posted by Perle and tagged by Ochi. A video of Biyi doing a basket toss double full layout. This is probably the first ever attempt in Singapore for a double full basket. 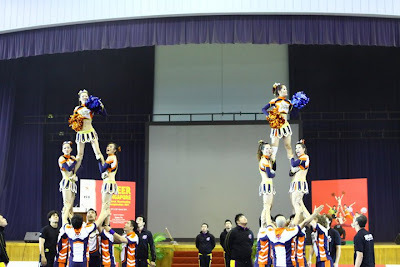 Jiayou Biyi and bases, I am sure you guys can perfect it even better your next try. P.S: This is the 10th VoM entry, a new record for our 1st year anniversary of VoM. The most number of entries in a month. We have few months that came close to 10 before (9 entries - June & November), but we hit 10th this month. Thanks to all the support over the past year. The 9th video for April VoM is by Perle once more. 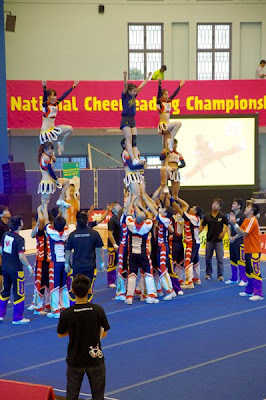 It is a video showing a basket toss by Xuewei as the flyer executing a pike open. 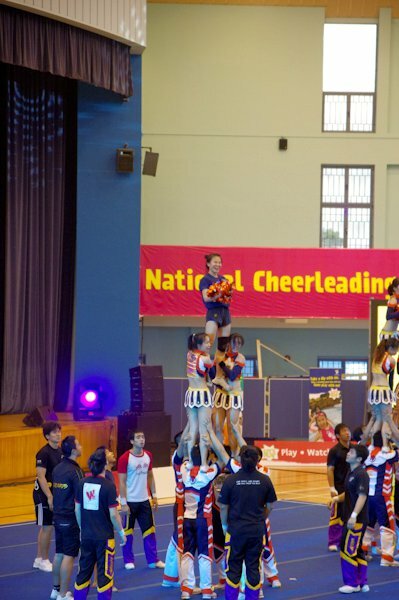 I really have to give it to Xuewei for her ability and love for doing basket tosses, and attempting tosses which she had stopped training since 2008. 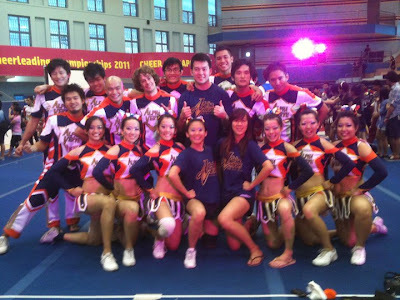 For our 7th entry of this month we have a video by Denvers Cheerleading Team, done by Wenjie. It was originally submitted by Harlis here(Note to all pls tagged me in the video itself for an entry. Thank you). Video entry for VoM these days looks very professionally done and this video definitely is among one of them, very well edited and themed very nicely. This is a video on their journey this seasion and also a part promotional/ recruitment video. The video starts off showing Denvers trying out different stunts and pyramids some which they did not use in the end, It also showed sniplets of Denvers during SNCC and SEACO. Congrats Denvers for their achievements this season and we are looking forward to more in future. For those interested to join Denvers, contact them (website above). The 3rd BPoM entry for April - THANK YOU EVERYONE ♥ by Nellie and thanks Huishan for tagging it, and you can find the original FB post with all the comments here. After every Nationals, everyone will have many emotions and people they want to thank. Nellie, who has been doing cheerleading for 6 years, posted this long entry to thank people who has helped her along this 6 years of her cheerleading career. I have to commend Nellie for this post, it was really full of effort and she took time from her school projects for this. The post is written full of feelings too and I am sure everyone whom you thanked can feel what you saying to them in their hearts, and for every single one of them whom have touched you in this 6 years; I am sure you have touched them too in their cheerleading life. I thank you Nellie, and on behalf of everyone too. Nellie you too made an impact to me, and cheerleaders like you are what keeps me going on in the pursuit of cheerleading. Am I now the 4th base to toss cupie you? haha. Thanks for stunting with me. Even if the post was not addressed to any of you reading this, I think Nellie's post still makes a very good read and you can get lot's of insights into the lives of a cheerleader, of a Wildcards cheerleader and most of all of Nellie as a cheerleader. Let's celebrate being a cheerleader together and of everything cheerleading has given us. Once a cheerleader always a cheerleader.